SCOOP: Haiti - Artist Okyjems wants to become a Senator of the Republic? 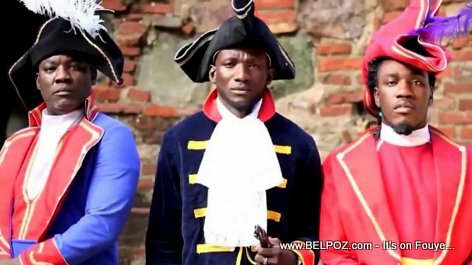 Okyjems left Haitian Compas music to become "Frere Sevère" the christian. Now Okyjems wants a seat in Haiti's Parliament. Okyjems Sevère wants to be Senator of the Republic. Tweet: Haiti - Okyjems Announces his Candidacy for Senator of Haiti? 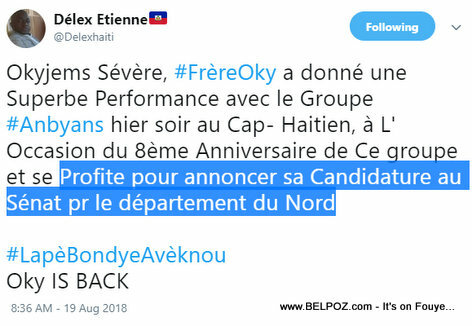 The tweet reads: Okyjems Sévère, # FrèreOky gave a superb performance with Group #Anbyans last night at Cap-Haitien, on the occasion of the 8th Anniversary of this group and took the opportunity to announce his candidacy in the Senate for the Department of the North. From music to religion, then straight to the Senate of the Republic. That's what you call a race! « Haiti's Parliament Building was attacked. Explosive Device or Gunfire? Si l te nan politik li patap pèdu fanm lan lèd konsa. Mais oui, l'homme ne vit pas seulement de la parole de Dieu. What does he know about social economic? That is what the country needs.